What do you call a spy that goes underwater? Who would’ve thought a joke that’s as old as the hills would become the basis of a video game superhero. 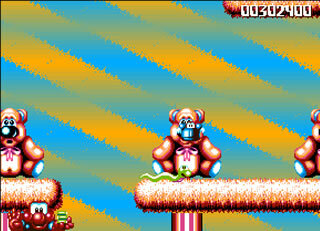 James Pond 2: Codename Robocod was released in 1991 to widespread critical acclaim. Although Dizzy tried, this was seen to be the computer system’s answer to Mario and Sonic. Firstly it was more of a platformer than Dizzy’s adventure, and the second was because as a platformer it was supremely polished. The game sees you play the part of James Pond, who appeared in the first game. In this game the game’s bad guy (Dr. Maybe, a play on a certain supervillain) has encased the world’s Penguins in a popular brand of chocolate biscuit. 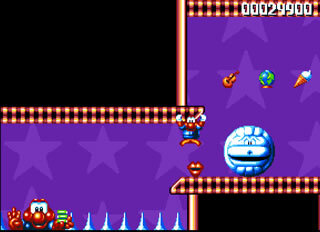 However, since the first game, James Pond has become Robocod, and he has a number of new abilities. The first is that with his robosuit he can now walk on land, an important requirement for a platformer, he can run, duck and jump. He can also defeat the enemies (which are sparse but annoying) by jumping and curling up into his suit, dropping on them. However his main new ability is the telextenser, which allows him to grapple ceilings, and shimmy across places he can’t jump accross. This does provide a nice strategy element to a platform game. However, elements can these do effect the flow of the game, as rather than a Mirror’s Edge esque leap and a grasp by the fingernails, followed by a powerful arm over arm shimmy, you have to stop, use the telextenser, make sure you’re safely on, then begin your shimmy, before dropping off in a safe area. Sonic and Mario wouldn’t do anything like this, as it does make the game a lot slower, and a little bit more strategic. However, these elements are few and far between, and there’s no point in the game which require you to begin shimmying under pressure. If there are any enemies nearby they can be easily defeated. Unlike Sonic and Mario though there are no powerups. Or very few. Stars increase the amount of hits you can take, and poison does remove hits. There’s also energy bars and penguins (large penguins) throughout the level, which much all be rescued before completing the level. By duck jumping, James Pond can defeat enemies. Overall, this is a rather fun platformer, with a dippy yet memorable soundtrack. With the telextenser, it was a nice effect, and was quite impressive an addon, because it require a nice amount of sprite manipulation in real time (which impressed a wannabe programmer such as myself). Long term it didn’t changed the world, however its well worth checking out as a fun, simple platformer.